Linda Preece's Merlion photography shows the statue in all its glory spouting water into the Singapore river as people gather on the viewing platform to marvel at the sights around Marina Bay. Singapore can be spelled out with these two words: MBS Infinity pool and the Merlion. The "ship" on top of a building and the mermaid lion that guards the lion-city with ferocity and welcoming charm. My introduction to the Merlion was when a client showed me a video of a Mermaid-Lion statue in a little city-state called Singapore. The video was showcasing national day with fireworks in the background and mesmerising lights lit up the Merlion, it was full of excitement and uniqueness. I fell in love even before coming to Singapore. 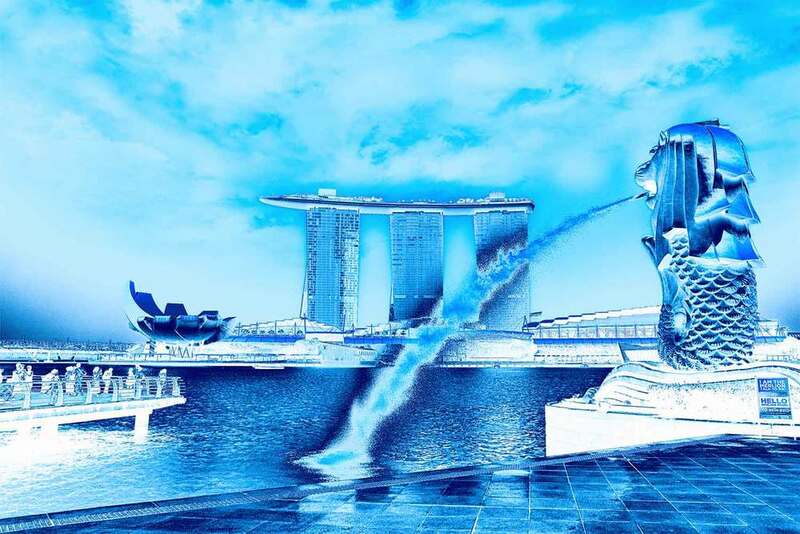 The Merlion collection shows the statue in all its glory spouting water into the river as people gather on the viewing platform to marvel at the the sights around Marina Bay. In the background you can see the lotus-like form of the ArtScience Museum and the famous Marina Bay Sands towers. For me this scene conjures up memories of drinks at Ku De Ta, sunny days at the infinity pool atop MBS, and evenings spent dining next to the water watching the spectacular light shows.